Nowadays, one of the selling points of smart devices (phones, tablets, watches, cameras, etc.) is how soon can they recharge their Li-polymer battery. There are already products which claim to be able to recharge from 10% to 100% within 20 minutes. The battery charging speed is an important convenience indicator. If your mobile device can recharge its battery within a short period of time, it will greatly reduce your waiting time for its battery recharging, and also reduce the need of bringing along a power bank. Imagine that when you are on the move and taking a short break at a place, you just need to borrow a power source for 5-10 minutes to quickly recharge your phone to bring up its battery level to be sufficient for the rest of the day, there will be less worry for you about the phone running out of battery power, and you don't need to wait for a long time for the recharging process. The Li-polymer battery fast charging technology evolves following the evolution of USB into Type C era, and the introduction of industry standard called USB Power Delivery (USB-PD). Traditionally, the USB cable has more emphasis on data transfer than charging function. The maximum power or Wattage (Power = Voltage x Current) a traditional USB cable and its charger can deliver is merely 2.5W. 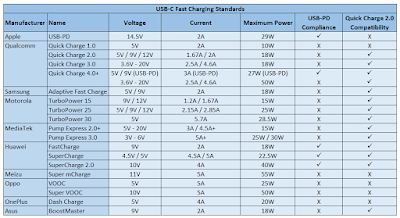 With the current USB 3.1 standard, theoretically the maximum charging power can go as high as 100W. The more wattage the charging mechanism can deliver, the faster will be the charging process. For fast charging to happen and to be safe, all the 4 charging components must be compatible and working well with each other. Otherwise, you will probably end up with traditional 2.5W slow charging, or your fast charging will be at risk of overheat, overcharge, battery damage or even device damage. Compatible fast charging components will form a charging mechanism that can deliver stable fast charging wattage, and has electronic circuits and mechanisms to protect the battery and device from being damaged (such as catching fire, explode, bulking, malfunction, ...), overheat, overcharge, etc. 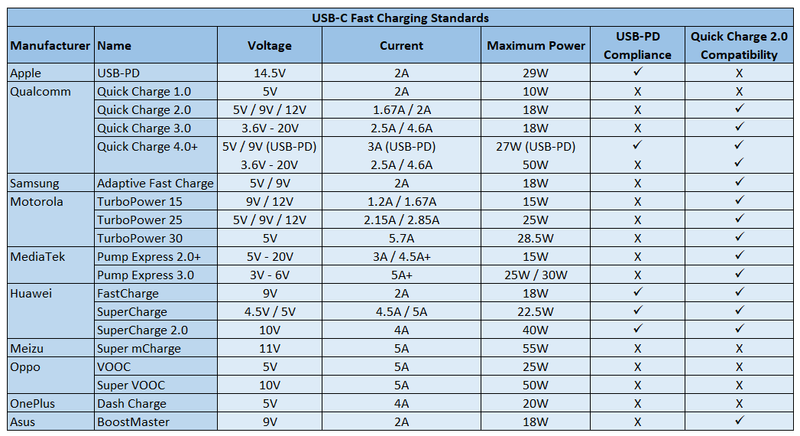 Different device manufacturer has come out with different kinds of fast charging mechanism, under different brand names such as Quick Charge, TurboPower, Pump Express, SuperCharge, VOOC, and so on. If the device and battery is USB-PD compliance, then you can fast charge it with 3rd party or other brand of USB cable and/or charger that are also USB-PD compliance. If the device and battery is Qualcomm Quick Charge compatible, then you can fast charge it with 3rd party or other brand of fast charger with Qualcomm Quick Charge chipset inside, using USB cable that supports 5A current transmission. If you want to play safe, the rule of thumb is to fast charge your device using original charger and original cable from the same manufacturer designed for your device. It seems that Oppo Super VOOC can charge its supported Oppo phones more faster than the others, however the Super VOOC charging mechanism is pretty proprietary. Huawei SuperCharge 2.0 found in its Mate 20 Pro, Mate 20X and later model of devices can also charge pretty fast at 40W, and is compatible to USB-PD and Qualcomm Quick Charge, although the wattage might be lower when fast charged with 3rd party compatible charger and cable. Choose the USB cable that can support 5A charging. It is backward compatible and more future proof. Choose the power bank that support Quick Charge 3.0 or Quick Charge 4.0+ to enable fast charging with compatible devices. Make sure it also has built-in mechanism to protect the battery and device properly. Choose for branded product that is reliable. Choose the wall charger that support the same charging voltage and current with your original wall charger. Make sure it also has built-in mechanism to protect the battery and device properly. Choose for branded product that is reliable.